In the early hours of Wednesday, May 16, three men were shot near Puerto Marqués, Acapulco. 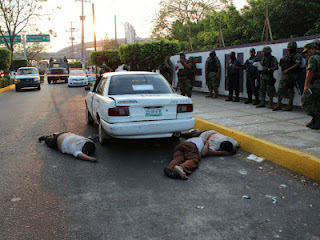 Their bodies were discarded in the town’s main thoroughfare, behind a taxi stand next to the "Instituto Leonardo Bravo". According to authorities, the murders occurred at approximately 6:35 a.m. An anonymous caller notified police that the men had been shot “in head and body” and dumped on the street. According to some witnesses, the bodies were tossed from a taxi belonging to the “Ignacio Allende” cab company operating in the municipality of Cruz Grande. They were found next to a Nissan Tsuru (see photo). According to federal authorities, apparently the taxi driver was shot, and then two passengers – one in the passenger front seat, and the other in the back – were violently removed from the vehicle and then each shot at least twice in the head and three times in the back. The assailants left four yellow and pink cards on the bodies that said: “This goes for all people from Camote, The Wini, and lacrosse ball. Attentively, the Devil’s Commando. The note actually wrote “jente” for people, instead of “gente”, and spelled lacrosse “lakorossos”. Camote, which means sweet potato, and Wini are apparently gang member names. Navy personnel as well as State and Municipal police cordoned off the area and awaited the arrival of the medical examiner and officials from the State Attorney General’s office. As well, on Tuesday night a male and female were found murdered in a Volkswagen Jetta. The female was a minor. The two were found in the Playa Hornos area near Acapulco’s main strip.